Gene Hammett studies HyperGrowth companies to understand the challenges and opportunities of quick growth. He consults with companies to develop new strategies and leadership shifts. He speaks internationally about leadership that inspires ownership and his HyperGrowth research. 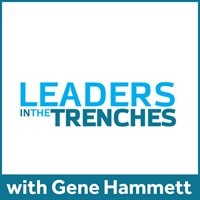 Gene’s podcast, Leaders in the Trenches, contains interviews of company leaders and experts about growth. Also, he authored the bestseller The Trap of Success. By Gene Hammett interviews business experts including Chris Brogan, Hal Elrod, Jeff Goins, Jon Loomer, Jordan Harbinger and many, many more! Develop leadership skills and understand leadership development from expert interviews with transformational leaders. Leaders in the Trenches gives raw discussions that dive deep into new strategies to accelerate your company growth and your leadership abilities. Get interviews from Fortune 100 leaders to experts in various domains of marketing, sales, and leadership that allows you to explode your growth. Learn from their failures and discover the finer elements of significance that will impact your company. Guests include Daymond John, Les Brown, Michael Gerber, Jonah Berger, Bob Berg, Greg McKeown, and with the host Gene Hammett.